Fat talk. We’ve all done it. Yes, even us FBGs who are totally gung-ho about body acceptance and positive body image. Fat talk — which is basically any negativity in regards to your body where you put yourself down to yourself or to others — is rampant. And, even more scary, it seems to be contagious. After all, how many times have you had a friend say something like, “Oh, these jeans make me look fat,” and the only thing you can think of to say back — and so you do — is, “Gosh, tell me about it. Why do you think I’m wearing this billowy top? It’s to hide my big stomach.” And then she complains, you complain … and it goes on and on. Sounds like girl talk, right? But how good does that girl talk actually make you feel? And is it helping you to be healthier and happier? Here are some facts … some pretty staggering facts. 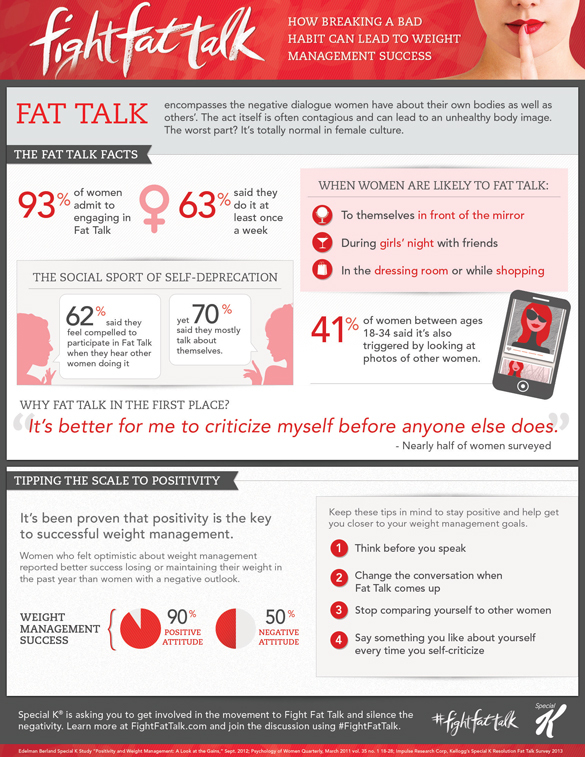 I mean, I know that fat talk isn’t good and it’s common, but 93 percent of women? And nearly half of women saying it because they want to criticize themselves before someone else can. And then there’s this new site I just came across that shares the stories of those who have been bullied for their bodies … Well, it all just makes my fit bottom want to weep. We are more than our bodies, but we act like that’s the only thing that’s to be valued. That the best way to bond is by dragging ourselves down. That it’s better to hide in humor than be seen. That the world only sees your body — and only accepts you if you look a certain way. As the infographic states there at the end, people who are more positive have a better shot of losing weight and keeping it off. And gosh knows that living in a more positive headspace just makes you happier and life better. And bullying? Well, clearly our entire culture needs to change — addressing both the broken spirits of those bullied and why those who are bullies are doing the bullying in the first place. In short, I think we need more focus on what really matters, and less on the outer appearance. So one of my resolutions for the New Year? Putting the kibosh on fat talk. I — after years of work at it — no longer talk about my body poorly in my head, but I won’t bond with others by shaming myself any more. I’ll remind the other person of an attribute (or 12) I admire about them. I’ll change the subject. I’ll speak up. I’ll do my best to stop the fat-talk loop we all seem to be stuck in. I’d be curious what % of men do this, because we do. I try and use it as motivation though… turn that negative into positive. Very interesting topic. I would also see what the percentage of men is. Negative self-talk is one way we subconsciously “armor up” (thanks Brene Brown!) to avoid being vulnerable in our lives. We think that somehow if we say unkind things to ourselves first, it will hurt less when others are unkind to us – but it doesn’t work that way. Just by bringing some awareness to the real culprit (fear), we can take some baby steps to overcome it. By making a practice of putting “positive word” deposits into our bank, we can build some resiliency to help us weather other people’s negativity. It’s so true that it’s a social thing! So crazy that we (myself definitely included!) have become so ok with hating on ourselves. It is much more socially acceptable to trash talk yourself than to talk about how great you are and how much you love yourself. It’s great to be more aware of this – so much of it is subconscious! Fat talk is a major problem for our youth. It’s surprising these numbers are this high. I really hope we can focus on more important things, like just being at optimum health. I too would be curious what the stats are on males that talk negatively about their appearance, whether it be over weight or something else. Women are too critical on themselves sometimes. You need to understand that we men think you’re all beautiful! Right with ya mate!!! A revolution is about to happen! There’s nothing wrong with being fat except that it raises various health issues in the long run. I am fat and I don’t want to look skinny. As long as you are able to remain healthy, you shouldn’t listen to what others say about you. Thanks for writing this awesome article. I am also curious what percent of men think this or think about how buff and ripped they are in a shirt or something along those lines. I don’t think it is just women.